Ten new key SORH staff recently attended the 2018 New SORH Orientation on December 5-6, 2018, in Bethesda, MD. Thank you to Corie Kaiser (OK) and Lynette Dickson (ND) who provided attendees with SORH leadership and management “tips and tricks”. Attendees were also introduced to the divisions of FORHP along with the Bureau of Health Workforce, Bureau of Primary Health Care, and met with their grant management specialist all within one day. Congratulations to Chris Salyers, NOSORH Education and Services Director, and Suzanne Stack, FORHP Public Health Analyst, for a successful meeting. A newly updated manual for new SORH staff is now available for download on the NOSORH website. The manual serves as a great primer to help understand rural health, acronyms and key rural health organizations. 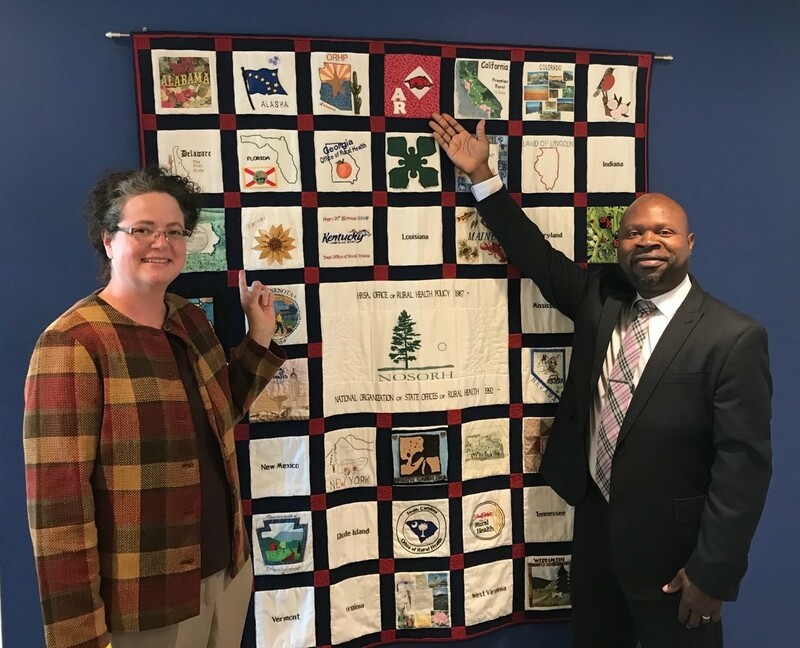 New SORH Directors Cynthia Snyder (KS) and Toney Bailey (AR) pose with the NOSORH quilt at FORHP offices. On October 24-25, eight new SORH staff and Chris Salyers, NOSORH Education and Services Director, attended a two-day orientation for new SORH Directors and key staff. Ahead of the orientation, NOSORH released its annual update to the New SORH Manual which can be found on the NOSORH website here. The goal of the meeting is to provide an overview of the many national rural resources available to SORH and allow Directors to meet with their project officers. The orientation included presentations from FORHP, the Bureau of Health Workforce, Grants Management, USDA, and many more key partners. New this year to the orientation was a session on navigating the Electronic Handbook (EHB). Attendees included eight Directors and key staff: Cynthia Snyder (Kansas), Maggie Sauer (North Carolina), Toney Bailey (Arkansas), Katie Reuman (South Dakota), Kevin Fleming (Kentucky), Anthony Griffin (Ohio), Matt McCullough (Utah), and Abby Garcia (Indiana). “The participants this year are a sharp group of individuals, and I really look forward to seeing how they lead their offices,” said Chris Salyers of NOSORH. “This orientation is a wonderful opportunity for new SORH staff, and we truly appreciate Suzanne Stack, SORH project officer with FORHP, for all the work she did in securing such great presenters.” Attendees indicated a 58% increase in content knowledge as a result of participation. A surprise this year was the fire alarm that went off in the morning of the second day, changing the schedule and limiting an opportunity for a group photo. Two directors, Kansas and Arkansas, were able to stay late and take a picture with the SORH quilt (see picture)!